GAME STALKER - The latest technology ever in digital game calling. The Game Stalker MP3 game caller with the addition of the instar-scan sound feature allows you to recall ten sounds at a time and view five sounds on the, LCD screen to choose your calling selection. 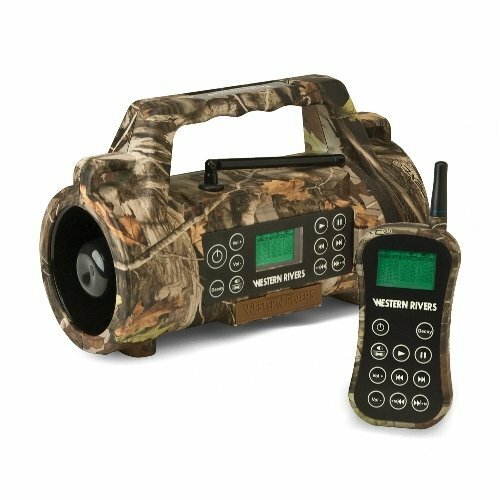 1GB storage capacity, Advanced 250 yard long range remote control, with liquid crystal green back light display, Extensive 300 pre-loaded game calls, Dual Hi-output horn speakers boost volume for peak performance, Select-a-speaker for remote changing speakers from left to right, Large key pads for ease of use in field with gloves, Instar-scan sound selection for fast scan of calls, Remote control uplink port/cable for sync of system (USB cable included), Caller operates on eight (8) AA batteries, remote operates on one (1) 9V battery.